Every year Pantone announce their colour of the year - and for 2019 they have chosen the vibrant ‘Living Coral’. I am a big fan of coral, and am really looking forward to seeing how this will translate in to the interiors and wedding industry especially. ‘Living Coral’ is quite a bold colour and could easily be overdone, but don’t let that put you off from incorporating it in your wedding styling. There are some simple ways that you can subtly and tastefully use it as an accent colour, bringing vibrancy and warmth to a more muted colour palette. By pairing with neutrals or greys and lots of greenery you can create a really sophisticated and timeless look. 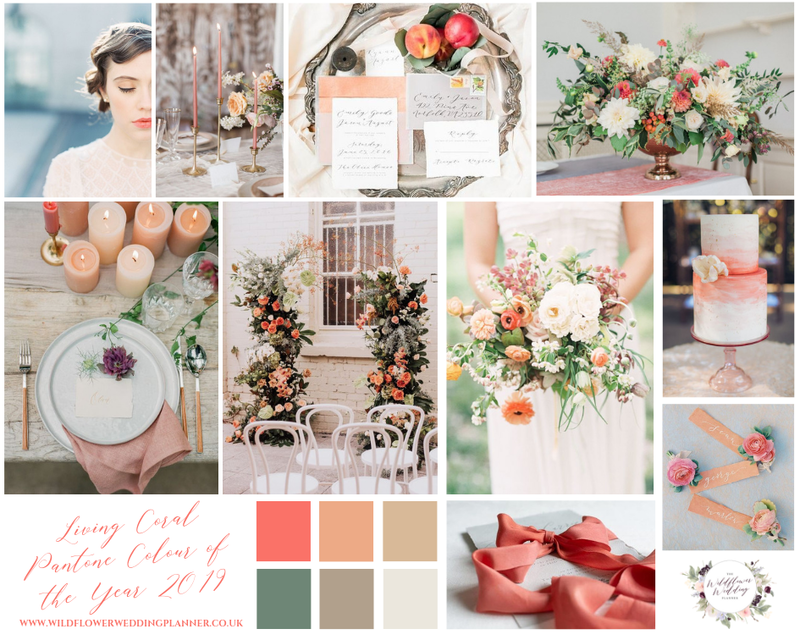 Here’s a mood board I have put together to demonstrate some of the ways you can include a pop of coral to your wedding styling. These minimal accents will still make an impact and I think this will make for a stunning palette for spring and summer weddings. From pops of bright coral blooms mixed in amongst more neutral blushes and white flowers and lots of greenery, using coloured hand-dyed silk ribbon as an accent on your stationery and stylish tapered candles and napkins for your tablescape, and even a soft coral lip colour, there are a whole host of ways to feature the Pantone Colour of the Year. So what do you think? Will you be embracing the Pantone Colour of the Year in your wedding styling? If you need any assistance with pulling your wedding style together I’d love to help - you can find out more about my wedding planning services here.